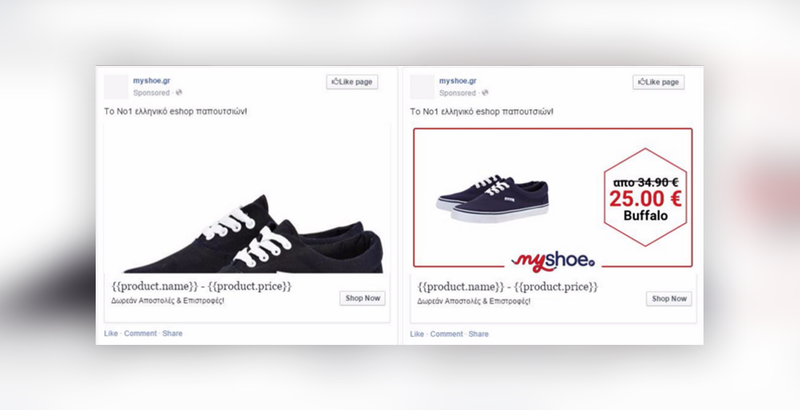 MyShoe is the leading Greek shoe retailer with more than 370k Facebook fans. Their e-commerce model has received several e-Volution awards, the Greek e-Commerce awards, among which the one for ‘Best Greek eShop’ and series of others. With focus on a professional customer service and well-designed website, they soon reached popularity while serving more than 12,5k products from 330 brands. If you have a successful brand, the importance of reaching also new customers is a challenge. Even higher priorities has well managed re-marketing which can create the biggest part of the budget. The goal for MyShoe was to optimize these processes and start scaling. MyShoe created its marketing campaign in collaboration with the marketing agency KoolMetrix which is using our platform ROI Hunter. The key points of this solution were a well formatted product feed and dynamic custom audiences from CRM which were updated by ROI Hunter every day. Using filters and performance data, helped them to create a product set including bestsellers which was advertised by Facebook dynamic product ads with tailored messages. KoolMetrix easily identified bestselling products from the feed in scale and selected the right categories for promotion. The best added value of advanced Facebook dynamic products ads is that Facebook has a sophisticated recommendation engine, which takes into consideration all signals common for people interested in a particular product to create a lookalike audience. This allowed Facebook to show the right products from each category and attract new relevant prospects. Advanced Facebook dynamic product ads represent a better solution for reaching new clients bringing higher traffic than single re-marketing. This way ROI Hunter targeted efficiently the most suitable audience and new prospects with products which always contained the correct price from the updated feed. In September 2015, they managed to 6x increase the ad spend and delivered 5.8x more transactions while keeping the CPA on the same level. The agency also saved a lot of time and money on creating banners and a huge amount of ads for each product. Moreover, the engagement went up as well, as the ads showed more relevant shoes to each user, that made them more likely to click on them. With DPA and MyShoe’s CRM, they could easily track customers‘ buying history, split them into segments according to their position in a marketing funnel and up-sell recent buyers. "ROI Hunter is the ultimate platform for managing and optimising Facebook multiple product ads. It has simplified our work, giving us more time to focus on the most important aspects of optimization and grow our business."